We are manufacturing FOOD GRADE SILICONE CONTAINER SEAL as per drawing, sample or as per customer requirement. - Our Container Seals have a Standard length of 70 mm. 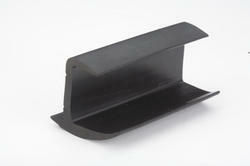 This Container Seal is plastic coated and Locking Rod is forged from Carbon Steel. Once the locking mechanism is meshed it cannot be opened or tampered. We are leading manufacturer of Container seals. We are a reputed firm engaged in offering a range of Container Seals. These products offered by us are manufactured using quality assured stainless steel, which is procured from the reliable vendors of the market. We make use of hot stamping or laser marking techniques to print or engrave logo and serial number on these seals. 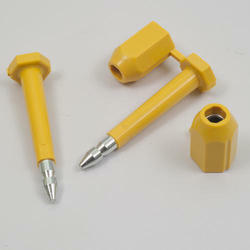 Being a customer oriented organization, we are deeply engaged in offering a wide array of Seal Bolt. Container Bolt seal is Heavy Duty Bolt Seal. We are renowned manufacturer of container seals, which are extensively used by exporters, logistics provider, ICD's custom. Procured from genuine vendors, we use good quality of raw material in the production of our range. The raw material includes iron and plastic. Our comprehensive range is highly appreciated for its longevity and resistance to wear and tear. Traders & suppliers of best quality containers bottle seals. We are one of the leading manufacturer and supplier in offering a quality range ofContainer Bolt Seals, these products are highly cost effective and reliable by security point of view, our products are as per quality standard which appreciated by our valuable clients.